According to the pilot in the tailwheel equipped, experimental amateur-built airplane, during the takeoff roll on runway 3, there was a slight crosswind and he was unable to maintain directional control of the airplane, possibly due to "wind shear." 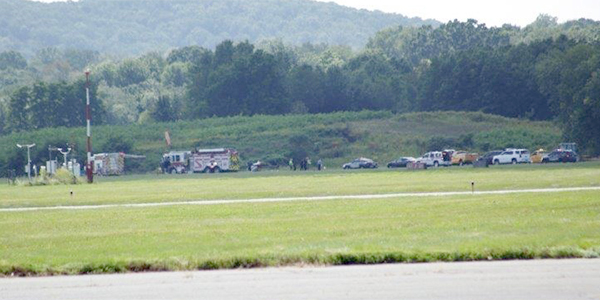 The airplane exited the left side of the runway and impacted the visual approach slope indicator (VASI) lights. The airplane sustained substantial damage to the aft fuselage bulkhead and the vertical stabilizer. According to the METAR at the accident airport, about the time of the accident, the wind was variable at 3kts, the visibility was greater than 10 statute miles, and there were Few clouds at 3,800ft. The temperature was 72°F and the dew point was 57°F. Wind shear was not reported. The pilot reported that there were no preaccident mechanical malfunctions or failures with the airplane that would have precluded normal operation.